With the introduction of the latest model in the Dimetix range of laser distance sensors, Sensors UK says it is possible to measure distances with millimeter precision, within a range of 0.05 to 30m at an affordable price. 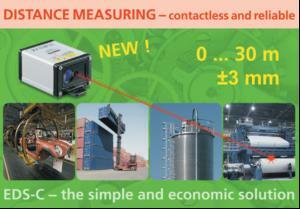 It is simple, flexible and measures without contact. Thanks to modern lasertechniques, distances, even to small objects, can be measured without contact. This is especially important when measuring in areas where access is limited, or exposed to extreme temperature conditions. The EDS-C unit uses a 24V DC power supply and has a rugged metal IP65 rated housing for extreme conditions.